There was a recent thread in the news group where a lot of people were saying how much they used (and missed) the availability of a list of an Applications’ Procedures. Seems that code completion wasn’t the best option when you can’t remember the name of the Procedure. And its quite understandable when you have many many procedures, possibly hundreds, in your .App. So thanks to some quick work by Diego, Scott and Alexey, we were able to slip this this new feature into the 7.2 release; the Data pad now has a “Procedures” node, and when selected it lists all template based procedures, the Procedures node is only activated when you are in any of the editors, and dbl-clicking on a procedure name in the list inserts the procedure name into the editor. The Procedures list also has a Windows Explorer style incremental locator. CHANGE: Code generation only executes from the application tree window, this prevents generation with partial or unsaved changes and ensures consistency for code generation. For this article we’ll dive further into the processing of XML files. There are two types of XML we may encounter, #1 well formed XML, #2 unknown XML files. #1 (well formed XML) documents are XML files that are correct in their syntax and will not require any validation, for this type of file we know from where they come from, and we know their format. #2 (unknown XML) are documents that we don’t know where they come from, or if they are syntactically correct and well formed. For the second type we won’t worry about because in this article we will be talking about how to read well formed files, the type of files that are created by an automated process to communicate between programs and share information, all that is done using well formed, well known XML documents. When we want to communicate with another program through an XML document we need to be able to write that document and to read that document. In this type of exchange the XML format used in that document is a well known format. We already saw how to write our XML document using the XMLGenerator class which creates a well formed document, and now we need to Read a “received” document. For reading an XML document a new class was recently added in C7; that class is the XMLParser. The XMLParser is a class that reads an XML document file and processes it, the document must be a valid document because the XMLParser does not validate the document, that is why we call the XMLParser a non-validating XML parser. Is a no-validating parser bad? Well no, it is not bad, it is just that, a non-validating parser. Because we will be reading a known file we don’t need to validate the files and we don’t need to loose any time in doing that. We are not creating a program that can read any random XML file, we only need to read a specific XML document. For that kind of file we don’t need any validation, we know the format and it is what we are expecting. The XMLParser included in C7 is very fast and its memory usage is very low. The parser does not store or create any structure with the XML data, instead it uses an interface and calls each method of that interface passing the XML Data. To use the parser the IXmlNotify interface needs to be implemented. The IXmlNotify is an interface declared in the file QuickXMLParser.INC, the same file where the XMLParser is declared. Why I need to implement the IXmlNotify to parse my XML file? The XMLParser does all the work of parsing the file but it does not know what to do with the data that comes from the XML Document. We need to “tell” the parser what to do with the data. Or in this case the parser will just inform us that it found some data and let us decide what to do with it. So the parser just reads the data and passes it to us. How is the data is passed to us? The parser calls the correct methods from the IXmlNotify interface based on the data that it reads. A quick look into the IXmlNotify interface will show that the methods are very simple. Not that many methods to implement, right? In each of the methods you implement you just write the code that is needed every time the parser finds some data that you are interested in. Remember that this is not a general purpose parser so you will know exactly the data that you will be receiving. Note: you can declare your string on run time based on the size of the XML file or you can receive the stream from a web server,etc. Most of the time you will have to parse a FILE, and that is why we extended the parser class to support a FILE name. You still need to tell the Parser what to do with the data that it is parsing, but now instead of implementing the IXmlNotify interface you just derive the VIRTUAL methods needed. Only one method call and the XML Document was parsed and the data was processed as you indicated. With the Virtual methods you only derive the methods that are called with the data you are interested in, so you don’t need to derive all the methods. As you can see each one match a method in the IXmlNotify. Summarizing both articles, an XML file is just a formatted text file, we can read the data contained by hand using a simple ASCII FILE but then we need to parse the file to extract the content, to make that process much easier we use the XMLFileParser class. To create a new XML file instead of just writing out the text we use the XMLGenerator class to simplify the process of creating the Tags and maintain the open/close of notation tags, also it ensures that we create a well formed XML document, and gives us the flexibility to create any type of XML document that we need in our program. Attached is an example on how to create a class that derives the methods to load a tree with the parsed document. It looks like the embed %AfterGeneratedApplication is a very popular embed these days. We already talked about it in the Template Tips #2 post where we compare it with the #AT(%ProgramEnd). Now we’ll compare #AT(%AfterGeneratedApplication) with #ATEND, and we’ll explain which of these is appropriate for a given task. Why do we compare #ATEND with #AT(%AfterGeneratedApplication) ? Because both of these are executed at the end of the code generation process (when we click on the Generate button). Some 3rd Party Templates have the need to execute code that requires the App to be have been generated, and you’ll find they make use of #ATEND or #AT(%AfterGeneratedApplication). All of the templates support #ATEND, but we’ll focus on the #APPLICATION #ATEND embed. The #ATEND is comparable to a Destructor of a class, it is executed at the end of a templates code generation cycle, and the purpose is typically to execute some clean up code. When I mention clean up code I’m not talking about generating backups, creating extra files, or doing some extra processing, etc. I’m talking about cleaning up template symbol values. Any other processing should not be executed in the #ATEND. One of the reasons additional processing should not be executed in the #ATEND is that the #ATEND is similar to a Class Destructor, and that means the scope of the template is already ending, so just like in any other Class Destructor. you should not be creating new instances of anything at that point. Another reason, that is more related to the templates is the Embeditor. What does the Embeditor have to do with the #APPLICATION #ATEND? Well if you inspect the #APPLICATION code closely you will see that there is one magic part that make the Embeditor work. Yes, the Embeditor code is just the #GENERATION of the procedure with a little bit of magic. Because this code is executed in the #APPLICATION section of the template we are expecting the #APPLICATION #ATEND to be executed. Actually everything would be executed if it was not for the #ABORT at the end of the above code. So if you are using the #ATEND, you are not only adding code to the equivalence of a Class Destructor, but you are also adding code that will always be executed unless you check for the value of the %EditFilename symbol. If the value of %EditFilename is null then you can be sure that you are in regular code generation, and not in the Embeditor generation. This is a very important point. Where does the #AT(%AfterGeneratedApplication) fit into all this code generation? Well the #EMBED(%AfterGeneratedApplication) is located at the end of the #APPLICATION template, it’s the last code to be generated before the #ATEND, but the big difference is that it only executes when we are generating the #APPLICATION during regular code generation. The execution of that embed will not happen on the Embeditor generation because of the #ABORT that we already mentioned. The conclusion, if you need to execute code at the end of the Application generation process, I always recommend the use of the #AT(%AfterGeneratedApplication) instead of the #ATEND. And always try to use a PRIORITY, that will make other templates play nice with yours. As with any other file format there are two basic processes that can be done with XML files; Reading and Writing. C7 supports doing both in many ways, without the need of any additional tools. In this article we’ll focus on two different methods, one for writing and one for reading. The method discussed for writing is not new to C7 but it was never used in this way. I’m talking about the XMLGenerator class, the same class as used in the Report Output templates. Most of the classes used in the Report Output were designed to be used independent of the Report itself. The XMLGenerator is no exception, and that is why it can be used in a very simple way to create XML files by hand coding the calls to the XMLGenerator methods. The methods are self-documented in the functionality, but lets introduce some code. First, as with any class contained within a separate module we need to include the module. After that we call the Init method passing the xml file name we want to create. And start to create the document content. that we set by calling the SetRootTag method. After that we need to start adding nodes to our tree. The Tags can have both attributes and content. In this case we add attributes to the last added Tag named ‘food’ with the AddAttribute method. After adding all our Tags and Attributes we just need to close the document and the content will be written to disk. As you can see, you can create any type of XML document, writing just a little code. the methods and the class will create the document for you. Just remember that the physical file does not exist until you close the document. Attached in this document is the full example to generate the XML file. This article reviews the essentials of the project system of Clarion 7, how it interacts with the application generator’s embed points, and the options that you have available to control or change the default behavior of the IDE. Understanding these options will make you more efficient and productive in the Clarion 7 IDE. We’ll start with an overview of the project system, discuss the origins of generated source code, and finish with the options available that control how you can edit errors in embeds when needed. Regarding the action of building a program created with a Clarion application file, Clarion 7 is the most flexible IDE in the product’s history. You can just generate source, generate source and make (build), and generate source, make (build), and then run the compiled program from the IDE. The highlighted IDE toolbar buttons shown in the above image are only enabled when an Application is opened for editing. Setting the Applications Pad to Generate Edited will perform the same actions as the buttons on the IDE toolbar. All buttons on the IDE toolbar and Applications Pad that display a “lightning bolt” will always affect the source generation of applications. …do NOT cause the source code generation; these buttons only run a “Build” against the source modules that already exists on disk. Let’s face it, stuff happens. The “stuff” that I’m referring to is errors in the source code that are generated from two basic sources of any application. We can break this down a little further. Since templates are read when loading an application, it is possible that something in your dictionary could cause bad code to be generated. Primarily this is from two areas of the dictionary; Triggers and Initial Values. A good tip here is to “mark” your code in the dictionary with a comment, like “DCT generated” or something like that. Embeds allow developers to modify or extend the functionality of the base templates by adding additional source code. Clarion provides two views of embeds. The Embed Editor is located in every procedure’s Embed tab. There is a hierarchical tree of entry points, and by default these embed points open a stand-alone editor that only applies to that selected embed point. The second view of embeds is the context view. In other words, how does your embed code fit in the context of the template generated code and other embed points? This is also called the Source Embeditor. With what was just discussed above, let’s now put it all together. …and the compiler detects errors, what source editor will be launched from the Errors Pad? The options to control what source editor will open is controlled by settings in the Application Options. To open the Application Options dialog, the application editor must be closed. Find this dialog and open it from the IDE Tools Menu (Tools > Application Options). There are three settings in the Applications Options that control your editor options. When working in the application editor, this option should always be OFF if you want items from the Errors Pad to open up in your favorite embed editor. With this option turned ON, ALL errors will always open the generated CLW source file, and if you edit errors and then later regenerate source from the Application Generator, your changes will be lost. Only use this option if you are simply testing or prototyping a coding scenario. The Edit errors in context (using Embeditor) option will open the Source Embeditor by default from the Errors Pad when this option is checked. When unchecked, clicking on errors in the Errors Pad will open the Embed Editor by default. The Source Embeditor (or embed editor) will open ONLY if the error in the Errors Pad is caused by an EMBED error. If the error is caused by bad dictionary information (like triggers or initial values), bad template entries, OR an embed that CAUSES bad GENERATED code (like a misplaced END statement), the error pad will ALWAYS open the CLW instead. So in nearly all cases except for the last one, when clicking on an error results in opening the CLW, you can be certain that the error is caused by an incorrect template setting or an error introduced in the Dictionary. The last option, Edit source embeds in context by default (Using Embeditor), does not affect how errors are processed, but instead controls what editor to use when opening an embed in the Embed Tree found in the Embeds tab. When it comes to handling coding errors in an efficient and productive manner, you need to know your project generation options in the Clarion 7 IDE, and know that errors can occur from two different application sources (templates or embeds), and ONLY errors from embed points will open the embed editor of your choice. The embed editor that you open (Embed Editor or Source Embeditor) is controlled by settings found in the Application Options window. We recommend that you set the Edit embedded source errors in generated code option to OFF (unchecked) and the Edit errors in context (using Embeditor) to ON (checked). These are the default settings of a newly installed Clarion 7 IDE. We found that some 3rd party templates that use #EXPORT or some other output are generating text in the middle of the generation of the APP itself. This can be very dangerous as it can “break” the code generation for the current module, leaving the user of that template with a partially generated file, or no file generated at all. We also found some templates are sometimes using the wrong embeds to call its functionality, and that can create a problem when the template fails for any error. The side efect of both of these template coding errors are code generation errors in the application generated source. So for templates developers we strongly encourage you to check the embeds you use and the location to ensure you are not generating code that can fail in the middle of the application generation process. main code generation of the APP. We recommend that if you have a 3rd party tool that does some extra processing with the APP to take a look at the code yourself or send a query to the developer of that tool and ask them to ensure their template is not doing any processing in the wrong embed (#AT(%ProgramEnd). Clarion 7.1 added the ability to automatically import and export .App and .Dct files to/from their text representations. This was primarily added for use with version control systems like Subversion, but developers may also find it useful for automated backup purposes. With this system any time a dictionary or application is saved it is automatically exported to text. If you load a dictionary or application and the text file has a newer time-stamp then the binary file, then the text file will be loaded into the binary file. With this system you can then check in and check out the text representation of your files into your version control system, and the IDE will automate updating the binary files. Further, if you are using Subversion as your version control system you can see the history of your file via the History tab (shown in the image below) appears at the bottom of the DCT Explorer or Application View. The History tab displays the version history pulled from your SVN repository. ClarionCl.exe is also auto import/export enabled. So if you use another new feature of Clarion 7.1 (Enterprise Edition) to generate an application, the .App and .Dct files will be updated if the timestamp of the text file is newer then the binary file. This allows you to use automated build tools like CruiseControl.NET to build your Clarion applications. 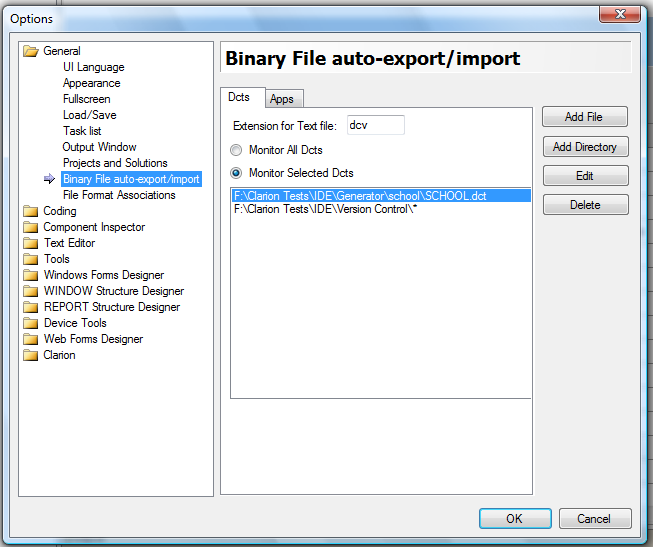 To enable automated import/export of files go to Tools/Options/General/Binary File auto-export/import. You will then have a screen similar to the image below. The import/export automation does its work on a background thread, so you should not see any impact on your normal work flow. This is one of many posts to come with advice and tips about things you should do, and things to avoid, when writing Templates. It is intended to help developers who write templates to validate their templates, and to implement some best practices to ensure the templates they deliver work as expected. The template language is very strict in its syntax, and blank spaces/lines can have a big impact. Spaces where they are not expected are evil. A blank line in the templates will generate a blank line in the generated code, but where that blank line lands in the generated code depends upon where that blank line is within the template code. Some areas of a template are not meant to generate code, for example #PROMPTs representing the UI. Some templates, like an Extension template, are not supposed to contain any generated code except within #ATs where the code is inserted into an #EMBED. If a blank line is found in a template, but in a place that is not correct, like between #PROMPTs, or outside a #AT in an Extension template, the code generator will push that line into the generated code, but because the blank line was in an incorrect location there is no explicit place to insert that blank line, and it will add it at the beginning of the block of generated code. To summarize, blank lines in a template are good, except when they are somewhere they are not supposed to be. Blank lines intended to make the template code easier to read should be always be replaced with #! in column 1 (or just removed). There isn’t a blank line “statement” in the template language, and the reason for that is so that you don’t not mix template language code, with generated output text. Using something like #!———- is much better than a blank line, better in that it is safer and it is more visual. In any template between a #PROMPT or any other UI code (#SHEET,#TAB,etc.). In #EXTENSION templates any blank line outside an #AT/#ENDAT block is incorrect. In a #UTILITY template any blank line outside the scope of an #OPEN or #CREATE is incorrect. In any template, any blank line used as a separator between #DECLARE statements or as a separator between any other statement is incorrect. As a golden rule, if the blank line is not intended to be output to the generated code, then the blank line should be replaced by a #! in column 1, or just removed. Geoff Thomson from Capesoft asked me about an example on how to override the RTL’s internal exception handler. I think this is a topic that is likely of interest to many Clarion developers and warrants an example, so here we go. This allows you to catch an exception, and if it is non-fatal you can allow your end users to continue executing your program even when an exception has occurred in one of its threads. The ICWExceptionInfo parameter is an interface declared in CWEXCPT.INT which you’ll find in your .Libsrc folder. If the result is equal to Zero, the RTL executes its own internal exception handler dialog to show information about the exception and subsequently perform the action chosen by the end user. If a Positive number is returned, the RTL stops the thread (or the entire process if the exception occurred in the main process thread) without invoking the RTL exception handler. If a Negative number is returned, the program will try to continue from the point of the exception. Note, if the exception is non-continuable, this result is ignored and treated as equal to Zero. in our example our Hook PROCEDURE does a “RETURN 1” and since we are running on the main thread then immediately after the MessageBox is displayed and the user presses the OK button the program itself is terminated.